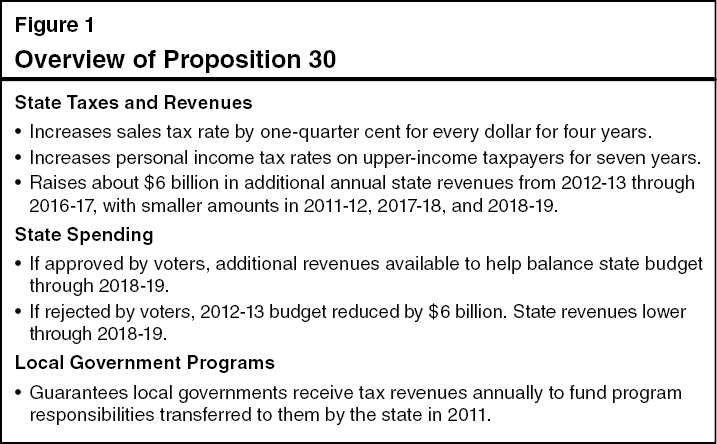 Proposition 30: Temporary Taxes to Fund Education. Guaranteed Local Public Safety Funding. Initiative Constitutional Amendment. Temporary Taxes to Fund Education. Guaranteed Local Public Safety Funding. Initiative Constitutional Amendment. Fiscal Impact: Increased state tax revenues through 2018-19, averaging about $6 billion annually over the next few years. Revenues available for funding state budget. In 2012-13, planned spending reductions, primarily to education programs, would not occur. A YES vote on this measure means: The state would increase personal income taxes on high-income taxpayers for seven years and sales taxes for four years. The new tax revenues would be available to fund programs in the state budget. A NO vote on this measure means: The state would not increase personal income taxes or sales taxes. State spending reductions, primarily to education programs, would take effect in 2012-13. This measure temporarily increases the state sales tax rate for all taxpayers and the personal income tax (PIT) rates for upper-income taxpayers. These temporary tax increases provide additional revenues to pay for programs funded in the state budget. The state’s 2012-13 budget plan—approved by the Legislature and the Governor in June 2012—assumes passage of this measure. The budget, however, also includes a backup plan that requires spending reductions (known as “trigger cuts”) in the event that voters reject this measure. This measure also places into the State Constitution certain requirements related to the recent transfer of some state program responsibilities to local governments. Figure 1 summarizes the main provisions of this proposition, which are discussed in more detail below. The General Fund is the state’s main operating account. In the 2010-11 fiscal year (which ran from July 1, 2010 to June 30, 2011), the General Fund’s total revenues were $93 billion. The General Fund’s three largest revenue sources are the PIT, the sales tax, and the corporate income tax. Sales Tax. Sales tax rates in California differ by locality. Currently, the average sales tax rate is just over 8 percent. A portion of sales tax revenues goes to the state, while the rest is allocated to local governments. The state General Fund received $27 billion of sales tax revenues during the 2010-11 fiscal year. Personal Income Tax. The PIT is a tax on wage, business, investment, and other income of individuals and families. State PIT rates range from 1 percent to 9.3 percent on the portions of a taxpayer’s income in each of several income brackets. (These are referred to as marginal tax rates.) Higher marginal tax rates are charged as income increases. The tax revenue generated from this tax—totaling $49.4 billion during the 2010-11 fiscal year—is deposited into the state’s General Fund. In addition, an extra 1 percent tax applies to annual income over $1 million (with the associated revenue dedicated to mental health services). Increases Sales Tax Rate From 2013 Through 2016. This measure temporarily increases the statewide sales tax rate by one-quarter cent for every dollar of goods purchased. This higher tax rate would be in effect for four years—from January 1, 2013 through the end of 2016. 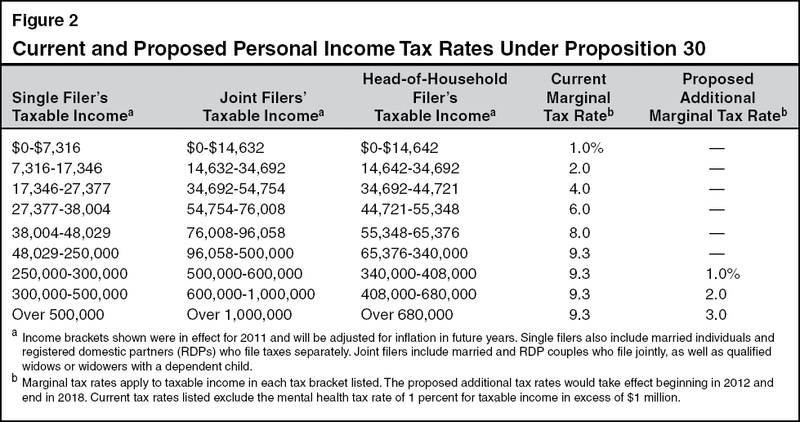 Increases Personal Income Tax Rates From 2012 Through 2018. As shown in Figure 2, this measure increases the existing 9.3 percent PIT rates on higher incomes. The additional marginal tax rates would increase as taxable income increases. For joint filers, for example, an additional 1 percent marginal tax rate would be imposed on income between $500,000 and $600,000 per year, increasing the total rate to 10.3 percent. Similarly, an additional 2 percent marginal tax rate would be imposed on income between $600,000 and $1 million, and an additional 3 percent marginal tax rate would be imposed on income above $1 million, increasing the total rates on these income brackets to 11.3 percent and 12.3 percent, respectively. These new tax rates would affect about 1 percent of California PIT filers. (These taxpayers currently pay about 40 percent of state personal income taxes.) The tax rates would be in effect for seven years—starting in the 2012 tax year and ending at the conclusion of the 2018 tax year. (Because the rate increase would apply as of January 1, 2012, affected taxpayers likely would have to make larger payments in the coming months to account for the full-year effect of the rate increase.) The additional 1 percent rate for mental health services would still apply to income in excess of $1 million. Proposition 30’s rate changes, therefore, would increase these taxpayers’ marginal PIT rate from 10.3 percent to 13.3 percent. Proposition 38 on this ballot would also increase PIT rates. The nearby box describes what would happen if both measures are approved. State Constitution Specifies What Happens if Two Measures Conflict. If provisions of two measures approved on the same statewide ballot conflict, the Constitution specifies that the provisions of the measure receiving more “yes” votes prevail. Proposition 30 and Proposition 38 on this statewide ballot both increase personal income tax (PIT) rates and, as such, could be viewed as conflicting. If Proposition 30 Receives More Yes Votes. Proposition 30 contains a section indicating that its provisions would prevail in their entirety and none of the provisions of any other measure increasing PIT rates—in this case Proposition 38—would go into effect. If Proposition 38 Receives More Yes Votes. Proposition 38 contains a section indicating that its provisions would prevail and the tax rate provisions of any other measure affecting sales or PIT rates—in this case Proposition 30—would not go into effect. Under this scenario, the spending reductions known as the “trigger cuts” would take effect as a result of Proposition 30’s tax increases not going into effect. Additional State Revenues Through 2018-19. Over the five fiscal years in which both the sales tax and PIT increases would be in effect (2012-13 through 2016-17), the average annual state revenue gain resulting from this measure’s tax increases is estimated at around $6 billion. Smaller revenue increases are likely in 2011-12, 2017-18, and 2018-19 due to the phasing in and phasing out of the higher tax rates. Revenues Could Change Significantly From Year to Year. The revenues raised by this measure could be subject to multibillion-dollar swings—either above or below the revenues projected above. This is because the vast majority of the additional revenue from this measure would come from the PIT rate increases on upper-income taxpayers. Most income reported by upper-income taxpayers is related in some way to their investments and businesses, rather than wages and salaries. While wages and salaries for upper-income taxpayers fluctuate to some extent, their investment income may change significantly from one year to the next depending upon the performance of the stock market, housing prices, and the economy. For example, the current mental health tax on income over $1 million generated about $730 million in 2009-10 but raised more than twice that amount in previous years. Due to these swings in the income of these taxpayers and the uncertainty of their responses to the rate increases, the revenues raised by this measure are difficult to estimate. State General Fund Supports Many Public Programs. Revenues deposited into the General Fund support a variety of programs—including public schools, public universities, health programs, social services, and prisons. School spending is the largest part of the state budget. Earlier propositions passed by state voters require the state to provide a minimum annual amount—commonly called the Proposition 98 minimum guarantee—for schools (kindergarten through high school) and community colleges (together referred to as K-14 education). The minimum guarantee is funded through a combination of state General Fund and local property tax revenues. In many years, the calculation of the minimum guarantee is highly sensitive to changes in state General Fund revenues. In years when General Fund revenues grow by a large amount, the guarantee is likely to increase by a large amount. A large share of the state and local funding that is allocated to schools and community colleges is “unrestricted,” meaning that they may use the funds for any educational purpose. New Tax Revenues Available to Fund Schools and Help Balance the Budget. The revenue generated by the measure’s temporary tax increases would be included in the calculations of the Proposition 98 minimum guarantee—raising the guarantee by billions of dollars each year. A portion of the new revenues therefore would be used to support higher school funding, with the remainder helping to balance the state budget. From an accounting perspective, the new revenues would be deposited into a newly created state account called the Education Protection Account (EPA). Of the funds in the account, 89 percent would be provided to schools and 11 percent to community colleges. Schools and community colleges could use these funds for any educational purpose. The funds would be distributed the same way as existing unrestricted per-student funding, except that no school district would receive less than $200 in EPA funds per student and no community college district would receive less than $100 in EPA funds per full-time student. K-14 payments. Given the large projected budget deficit, the budget plan also includes actions to constrain spending in some health and social services programs, decrease state employee compensation, use one-time funds, and borrow from other state accounts. Effect on Budgets Through 2018-19. This measure’s additional tax revenues would be available to help balance the state budget through 2018-19. The additional revenues from this measure provide several billion dollars annually through 2018-19 that would be available for a wide range of purposes—including funding existing state programs, ending K-14 education payment delays, and paying other state debts. Future actions of the Legislature and the Governor would determine the use of these funds. At the same time, due to swings in the income of upper-income taxpayers, potential state revenue fluctuations under this measure could complicate state budgeting in some years. After the proposed tax increases expire, the loss of the associated tax revenues could create additional budget pressure in subsequent years. 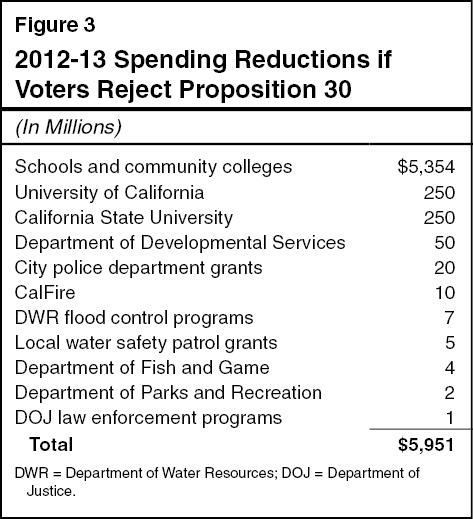 Backup Budget Plan Reduces Spending if Voters Reject This Measure. If this measure fails, the state would not receive the additional revenues generated by the proposition’s tax increases. In this situation, the 2012-13 budget plan requires that its spending be reduced by $6 billion. These trigger cuts, as currently scheduled in state law, are shown in Figure 3. Almost all the reductions are to education programs—$5.4 billion to K-14 education and $500 million to public universities. Of the K-14 reductions, roughly $3 billion is a cut in unrestricted funding. Schools and community colleges could respond to this cut in various ways, including drawing down reserves, shortening the instructional year for schools, and reducing enrollment for community colleges. The remaining $2.4 billion reduction would increase the amount of late payments to schools and community colleges back to the 2011-12 level. This could affect the cash needs of schools and community colleges late in the fiscal year, potentially resulting in greater short-term borrowing. Effect on Budgets Through 2018-19. If this measure is rejected by voters, state revenues would be billions of dollars lower each year through 2018-19 than if the measure were approved. Future actions of the Legislature and the Governor would determine how to balance the state budget at this lower level of revenues. Future state budgets could be balanced through cuts to schools or other programs, new revenues, and one-time actions. In 2011, the state transferred the responsibility for administering and funding several programs to local governments (primarily counties). The transferred program responsibilities include incarcerating certain adult offenders, supervising parolees, and providing substance abuse treatment services. To pay for these new obligations, the Legislature passed a law transferring about $6 billion of state tax revenues to local governments annually. Most of these funds come from a shift of a portion of the sales tax from the state to local governments. This measure places into the Constitution certain provisions related to the 2011 transfer of state program responsibilities. Guarantees Ongoing Revenues to Local Governments. This measure requires the state to continue providing the tax revenues redirected in 2011 (or equivalent funds) to local governments to pay for the transferred program responsibilities. The measure also permanently excludes the sales tax revenues redirected to local governments from the calculation of the minimum funding guarantee for schools and community colleges. Restricts State Authority to Expand Program Requirements. Local governments would not be required to implement any future state laws that increase local costs to administer the program responsibilities transferred in 2011, unless the state provided additional money to pay for the increased costs. Requires State to Share Some Unanticipated Program Costs. The measure requires the state to pay part of any new local costs that result from certain court actions and changes in federal statutes or regulations related to the transferred program responsibilities. Eliminates Potential Mandate Funding Liability. Under the Constitution, the state must reimburse local governments when it imposes new responsibilities or “mandates” upon them. Under current law, the state could be required to provide local governments with additional funding (mandate reimbursements) to pay for some of the transferred program responsibilities. This measure specifies that the state would not be required to provide such mandate reimbursements. Ends State Reimbursement of Open Meeting Act Costs. The Ralph M. Brown Act requires that all meetings of local legislative bodies be open and public. In the past, the state has reimbursed local governments for costs resulting from certain provisions of the Brown Act (such as the requirement to prepare and post agendas for public meetings). This measure specifies that the state would not be responsible for paying local agencies for the costs of following the open meeting procedures in the Brown Act. State Government. State costs could be higher for the transferred programs than they otherwise would have been because this measure (1) guarantees that the state will continue providing funds to local governments to pay for them, (2) requires the state to share part of the costs associated with future federal law changes and court cases, and (3) authorizes local governments to refuse to implement new state laws and regulations that increase their costs unless the state provides additional funds. These potential costs would be offset in part by the measure’s provisions eliminating any potential state mandate liability from the 2011 program transfer and Brown Act procedures. The net fiscal effect of these provisions is not possible to determine and would depend on future actions by elected officials and the courts. Local Government. The factors discussed above would have the opposite fiscal effect on local governments. That is, local government revenues could be higher than they otherwise would have been because the state would be required to (1) continue providing funds to local governments to pay for the program responsibilities transferred in 2011 and (2) pay all or part of the costs associated with future federal and state law changes and court cases. These increased local revenues would be offset in part by the measure’s provisions eliminating local government authority to receive mandate reimbursements for the 2011 program shift and Brown Act procedures. The net fiscal effect of these provisions is not possible to determine and would depend on future actions by elected officials and the courts. If voters approve this measure, the state sales tax rate would increase for four years and PIT rates would increase for seven years, generating an estimated $6 billion annually in additional state revenues, on average, between 2012-13 and 2016-17. (Smaller revenue increases are likely for the 2011-12, 2017-18, and 2018-19 fiscal years.) These revenues would be used to help fund the state’s 2012-13 budget plan and would be available to help balance the budget over the next seven years. The measure also would guarantee that local governments continue to annually receive the share of state tax revenues transferred in 2011 to pay for the shift of some state program responsibilities to local governments. If voters reject this measure, state sales tax and PIT rates would not increase. Because funds from these tax increases would not be available to help fund the state’s 2012-13 budget plan, state spending in 2012-13 would be reduced by about $6 billion, with almost all the reductions related to education. In future years, state revenues would be billions of dollars lower than if the measure were approved.